PRICED TO SELL!! This STANDOUT HOME Conveniently Located just outside Cherrydale (5 Min to Downtown Greenville and 10 min to Dowtown Travelers Rest) in the Booming Historic Sans Souci area. 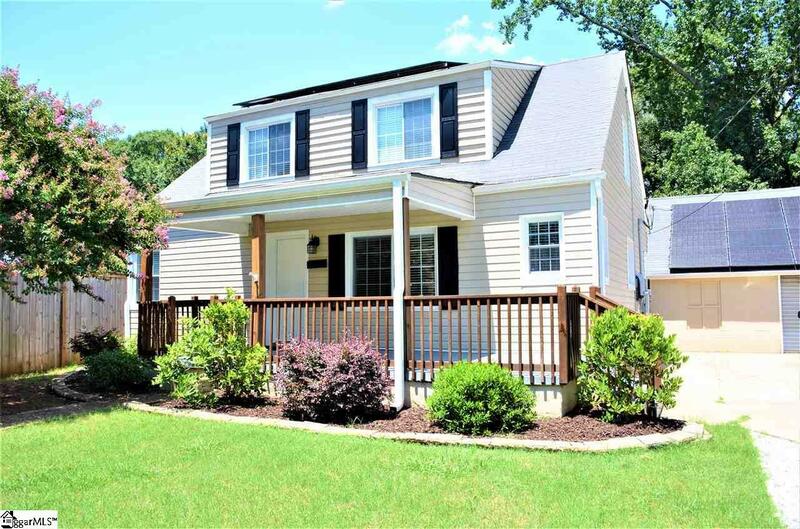 This Home boasts 4 Bedroom, 2 Full Baths, Large Bonus Room, and Loft area upstairs. Nearly 2000 sq ft of Beautiful Home with plenty of Upgrades including; SOLAR PANELS with warranty that provide the vast majority of the electricity; Large Fenced Yard; Detached Garage; New Deck and Plenty of Outdoor Living Space; Duel Zone HVAC and all new ductwork; Walk-In Closet in the Master suite; custom outdoor lighting; and Unfinished Basement area for additional storage. This Home has all the Old Charm that makes these homes so attractive, yet many Luxuries of Modern Updates and Technology. Upon entering the home, you will be Struck by the gleaming 1 inch Hardwoods, open Living Area, and Fresh Paint. The main level consists of 2 large bedrooms, Full Bath, Open living/dining/office area, Kitchen with stainless steel appliances, large Bonus room, and staircase to the Unfinished Slab Basement area. The Upstairs is on its OWN HVAC Zone (so no temperature differential like many other 2 story homes in the area) and consists of a Loft area, Large Master Suite with gorgeous Hardwoods and Large Walk-in-Closet, 4th bedroom, Full bath, and access to the Newly Over Insulated attic space. Outside you will find; Large and Level Fenced in Yard, New Deck with river stone BBQ area between the deck and Detached Garage, Custom High End Lighting, freshly painted Front Porch, gorgeous Landscaping, and Widened Driveway. SOLAR PANELS with WARRANTY leave the owners with Little to No Electric bill and Worry Free!! This is a HUGE COSTS SAVER!! Detached garage has plenty of storage space and has an unfinished room upstairs. This is an Absolute GEM and a RARE find in such a Booming Area....schedule your appointment today!